Zipping through my backlog of blog subscriptions this morning, I found this link to Karen’s review of Knitting Heaven and Earth by Susan Gordon Lydon. This made me so happy, because I was hoping the sky would clear up enough today for me to take a few pictures of my current sock for you, and I’m happy to link you to the review while I do so. Before I started knitting, I would not have believed that any sort of craft would become such a part of my life. This is Lana Grossa Meilenweit Marmi in 7003, which is no longer languishing in my closetI didn’t intend to knit this sock. I was working on another one a few days ago. I carried it around in a little elastane drawstring bag. A woman sat across from me on the bus and watched my fingers working rapidly. She smiled. “I can crochet, but knitting look too hard.” She had a warm island accent and was bundled up in an even puffier coat than I was. “It all makes sense once you start,” I said. It does, but I know what it looks like from outside. Having five needles going all at once looks like magic, like I’m standing over a cauldron waving my hands and speaking arcane languages. It looks much harder than it is, but it’s hypnotic whether you’re watching it or doing it. That day, I put the little elastane bag down somewhere and I haven’t seen it since. I even called all the places I was that day, and no one found it. So I took a deep breath, let the yarn go, and started another sock. This sock. With only four needles, which makes things slightly more difficult and less impressive to look at in process, but only a little on both counts. I started to knit after my mother died. I had knit a little scarf before and chalked it up to something I’d tried and accomplished, and hadn’t bothered again. But when I returned to real life after my hometown sojourn, one of the ways I quieted my head was by giving my hands something to do. There is a buzz in my head when I’m stressed, like a slightly-too-loud fluorescent light, and it magnifies every negative and mutes every positive. Turning a quarter of a mile of string into a pair of socks? It stops the buzzing. That I have something useful when I’m done is almost a bonus, since it’s the process that calms me down and brings me pleasure. This yarn is mostly pink with shots of cream and brown. It looks like an almost-empty bowl of cherry-vanilla ice cream with Hershey’s syrup on top. The color variation means that a plain sock without cables or patterning is best, because those things look better in yarn that’s closer to monochromes. This, too, brings me pleasure. And so does settling down in the chair in the living room and letting my hands go, counting every once in awhile, watching through the back door as people walk on their way home from school and work and playing in the park while dogs kick up plumes of snow. Every single time, I marvel at the twenty minutes’ worth of geometry and stitching that turns the tube into a sock with a heel. When Myron comes home from chess tonight, I’ll be nearly ready to finish the toe. Over the past year I have not made much time for knitting. Now, while I consider the changes I’m making in the manuscript as I revise—some of which are unfortunately major—I need that annoying buzz turned off more than I have in a while. 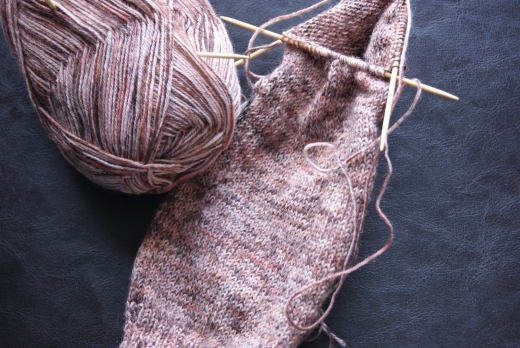 It’s a good thing that I have so many socks to finish this year before the snow stops falling. Toes will be toasty. This is the first time I’ve thought one of the prompts was easy! Without exaggeration, this is one of the most effortless scarves in the world, and yet it’s stunning. I took this eons ago with a dying camera, and I wish I’d been able to capture the colors better. (Nothing like builder-oatmeal carpet to give backgrounds an extra zing.) It’s Jared Flood’s Noro Striped Scarf, and I gave it to my friend Cate in Calgary. Calgary has worse winters than I do, and longer too, so technically Cate needs it more than I do, but God I wanted to keep it. However, she has a gorgeous English complexion and stop-your-heart eyes, so I went with cool colors that aren’t for me. And no fringe! It never stays as nice as I wish it would. I cannot put my hands on the specific colors now, but the project is unpredictable yet consistently wow-worthy. No matter which colors you pick, the contrasts in each row are fascinating from beginning to end. I kept telling myself I’d stop after four more rows, only to see the color change a bit more in the skein and keep going. I can’t imagine one of these looking bad. The Ravelry images are all amazing, even ones with colors I’d usually avoid, like hits of acid green or Barbie pink. The contrast is a part of this, but mostly it’s due to Noro’s colors, which are cultishly revered. I’ve got a lot of socks to make this winter, but Reverb10 is taking my free time this month. And I’ve met so many wonderful people that are much nicer than socks. Even handknit socks. It’s a good trade.